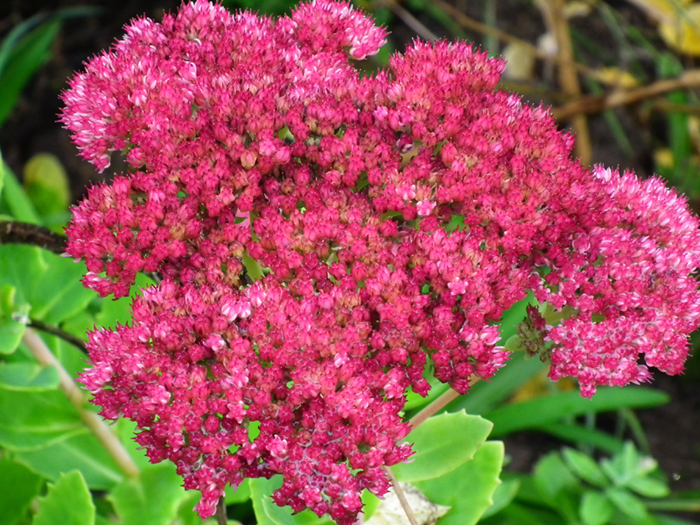 ﻿﻿It's at this time of year that you start to notice the gaps where colour and structure perhaps are needed to bring certain areas of the garden together - not so easy to see during the summer months when the garden is full to brimming with interest. So if you're thinking of re-planting part of your garden or are starting from scratch I thought I'd share some of the pictures I took in our garden in Brittany today in between the showers - do bear in mind that most of the plants and shrubs that survive here will also do well in the south of England as well as a bit further north too - we had temperatures as low as -9 degrees last year and up to about 32 degrees during this last summer and as yet despite frosts in the UK as I understand, we've escaped this so far! 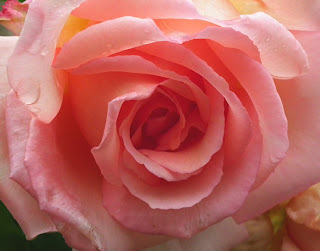 Rosa Compassion has been amazing this year and as you can see providing amazing blooms even into October - the other rose also doing well is Madame Alfred Carriere - also high on my list of recommendations of a repeat very scented semi climbing/rambler rose. 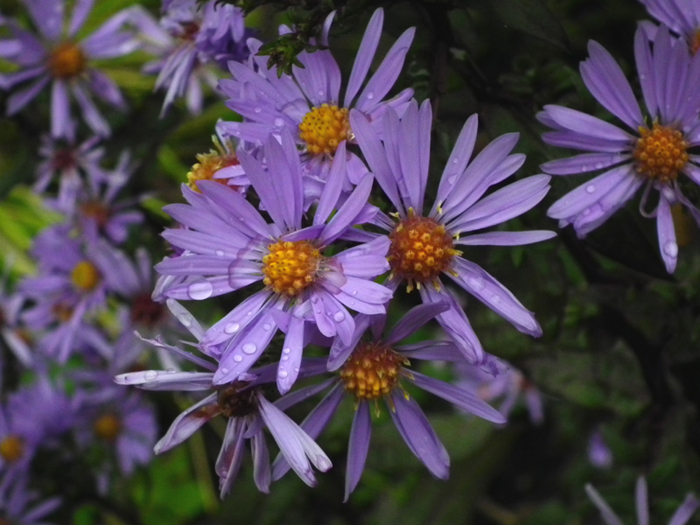 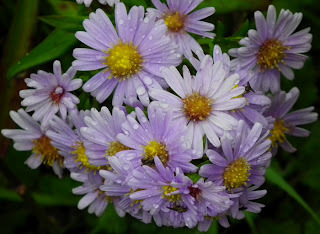 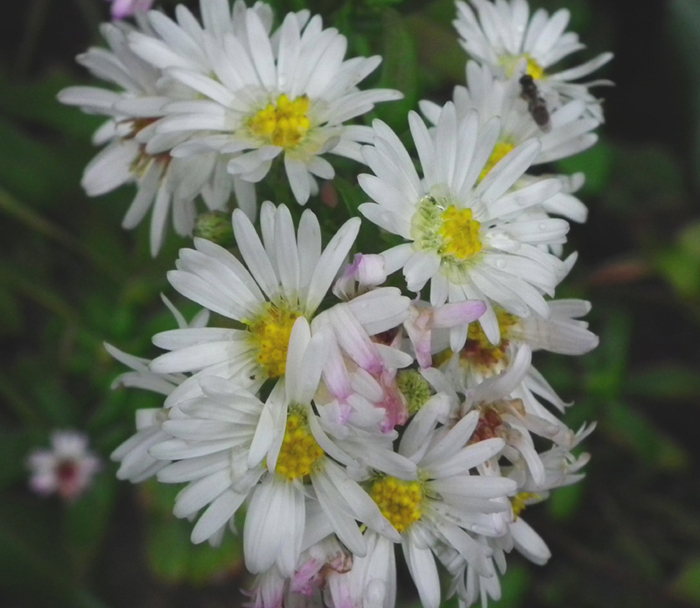 The other perennial that comes into their own at this time of year is the humble Aster - providing essential pollen for bees and butterflies alike and more than popular for many of the insect world too. 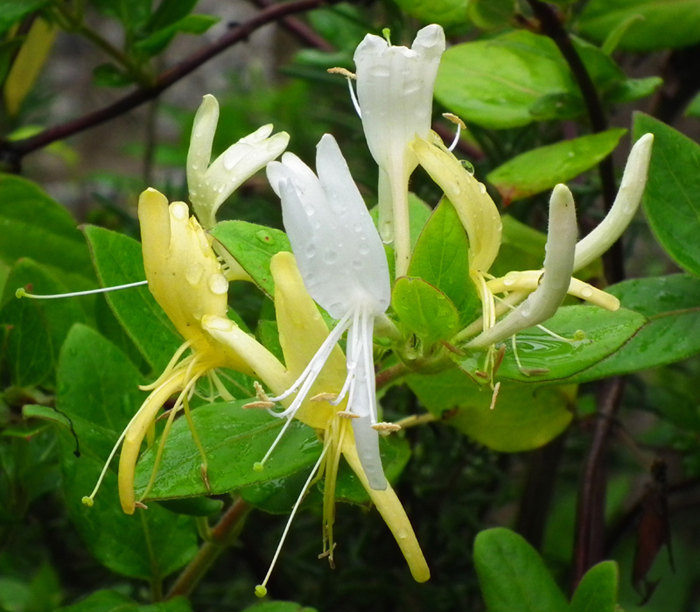 This beautiful Honeysuckle - Lonicera japonica "Halliana" is a semi evergreen which despite the cold temperatures last year still held onto its leaves - it also has a fantastic perfume as well as being a prolific grower - the blackbirds and thrushes love this is a nesting site. 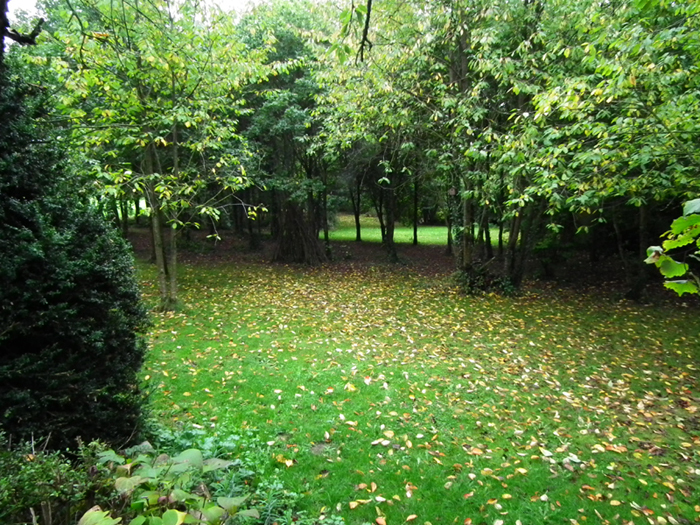 Our woodland is currently a carpet of leaves as you can see - mainly from the cherry trees - the Oaks tend to lose their leaves a lot later - with all the wind and rain this last week leaves seem to be falling rather quicker than normal! 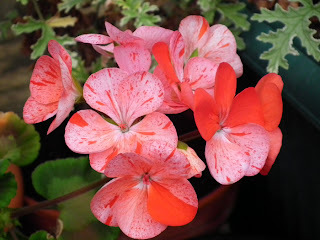 I love this time of year with all the changing leaf colours - spring does seem a while away so I thought I'd take some of the plants that have endured one of the dryest summers we've had yet and are certainly benefitting from all the recent rain. 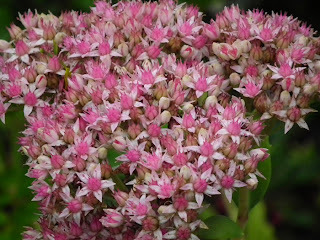 These two brightly coloured Sedums are great plants for providing colour and are a favorite amongst butterflies and bees again but also doing well in all the hot dry weather too - so plants to consider if you've got an area where the soil dries out more quickly than others - they also prefer a sunny spot! 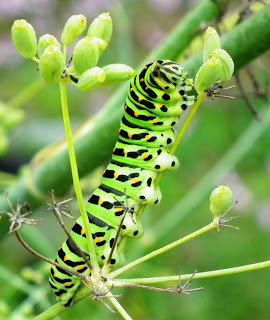 This brightly coloured chap (or chapess!) 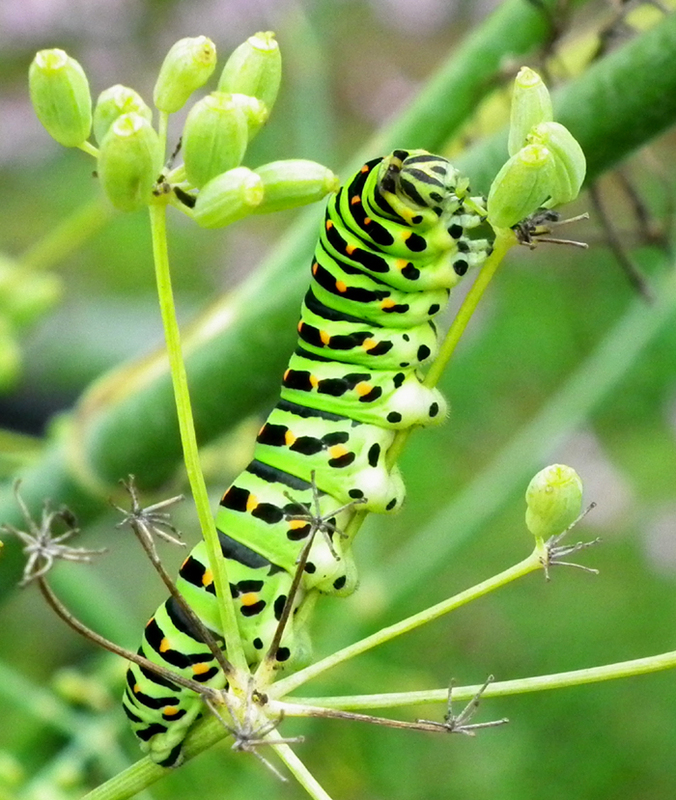 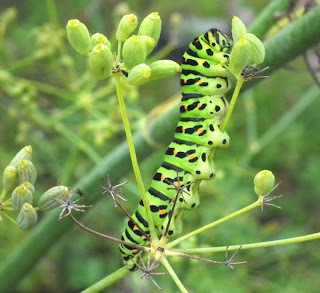 I found on the Fennel - the rather stunning Swallowtail Butterfly caterpillar. 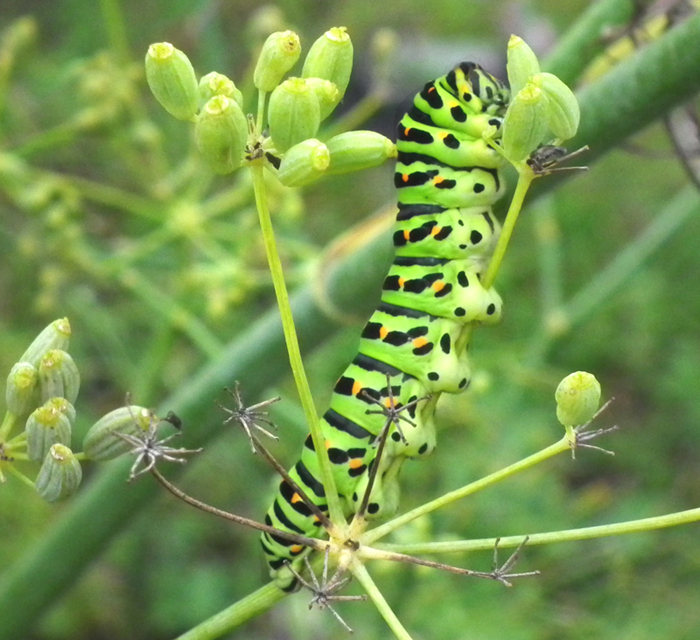 As well as Fennel they also like Dill - we seem to have had quite a good number of these this year - more than usual and have also seen many more Swallow Tail's too - they are incredible butterflies flying to amazing heights compared to many others here. 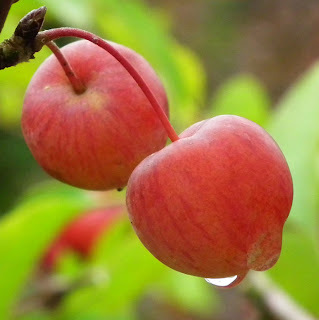 I don't think any garden should be without a Crab Apple - this one is Malus "Everest" and provides a wonderful show of blossom in late spring and then these beautiful rosy crab apples in Autumn which last well into the winter - good for Jellies or just leave them for the birds and when it's really cold provides them with some essential feeding - the Song Thrush, Blackbird and Black Caps were amongst those birds feasting on these last winter. 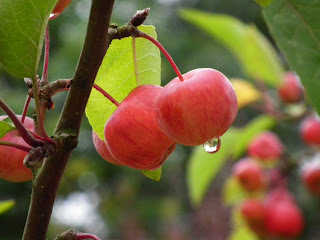 It's not a large tree so suitable for the smaller garden too. 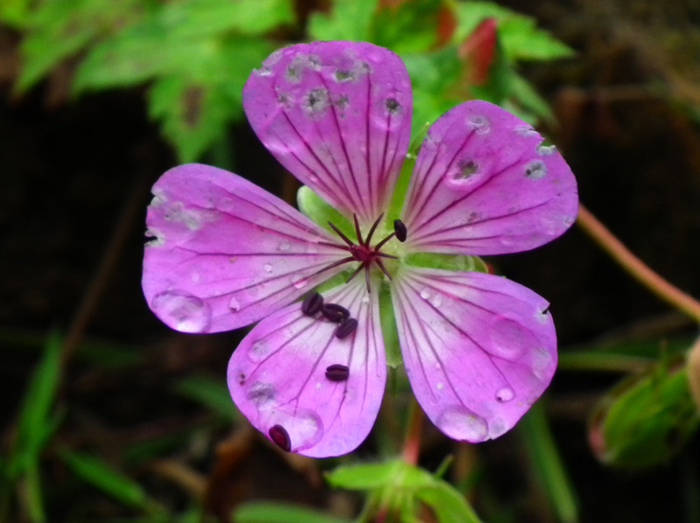 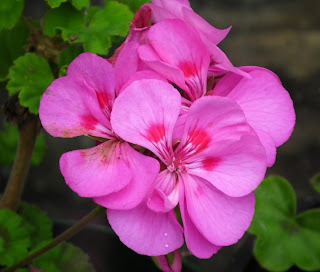 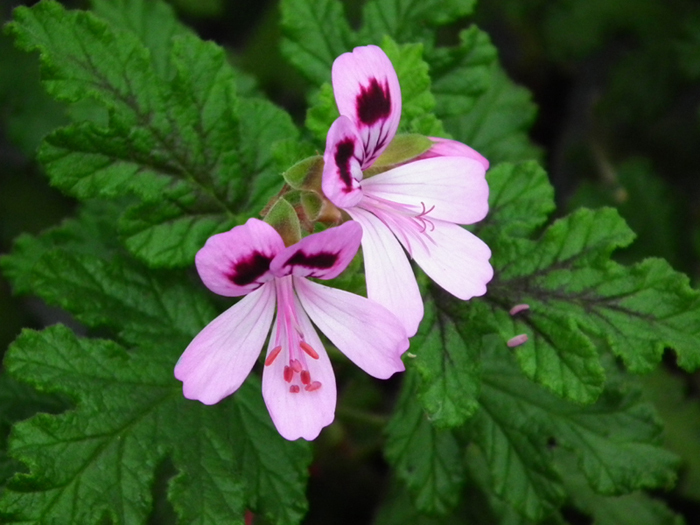 These rather colourful Geraniums / Pelargoniums are in our greenhouse - the bees seem more than happy to go the extra mile to visit these blooms - particualrly the scented leaved Pelargonium. 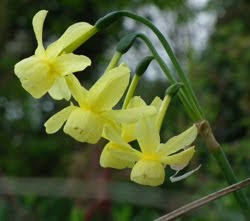 As frosts become more imminent do bring in any favorites that you have outside in pots - you might even think of taken a few cuttings too. 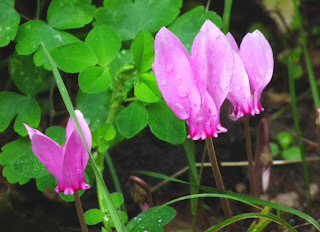 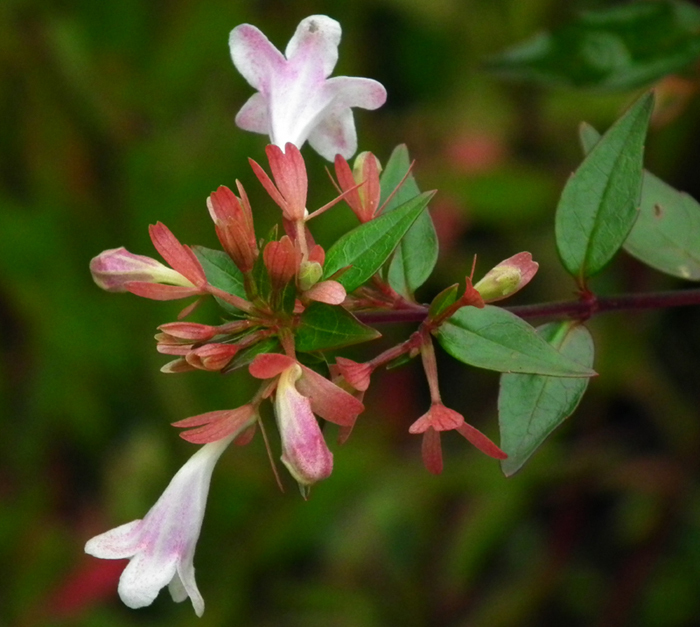 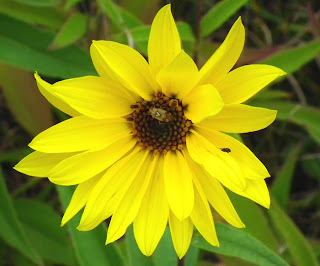 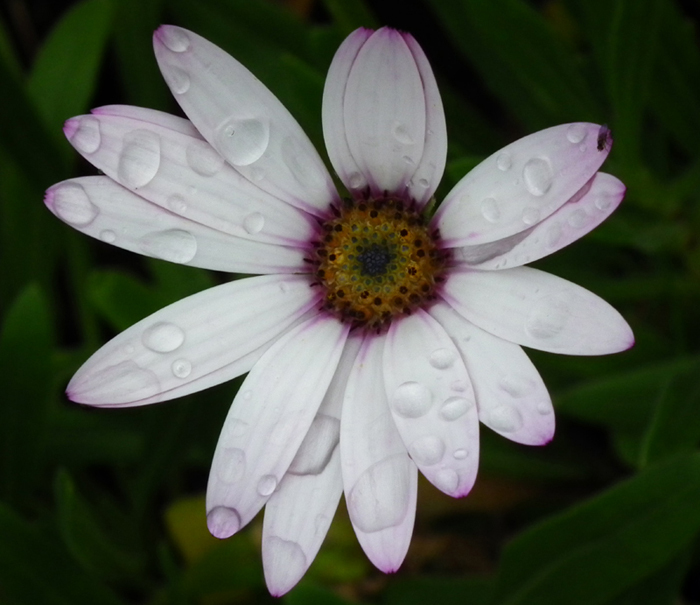 There are just so many plants in flower at this time of year giving plenty of choice if you're looking for new additions to your own garden for next year.. here are a few more of my favorites. 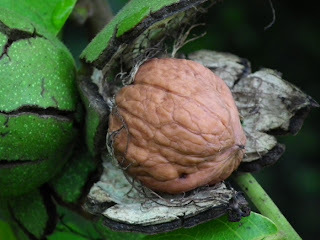 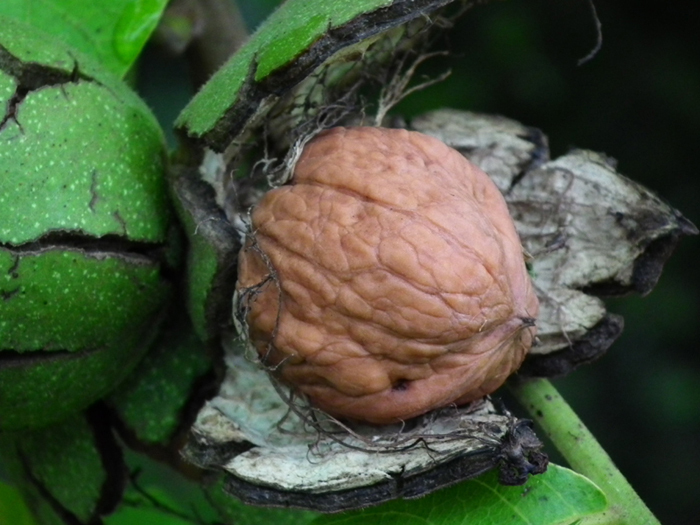 Last but not least the lovely Walnut - it's going to be another good year for these and we've got a good carpet of already fallen nuts on the ground - do hope the weather dries out a bit to enable us to get these in before they're all gobbled up by the birds, mice and foxes!